Freelance coach available in the Halton/Mississauga and surrounding areas. Lessons based on helping riders understand their horses and the rider’s reactions and why instructions are given. Training programs to facilitate the development and correct use of the seat - riding the horse from behind into a seeking contact, enabling self carriage. 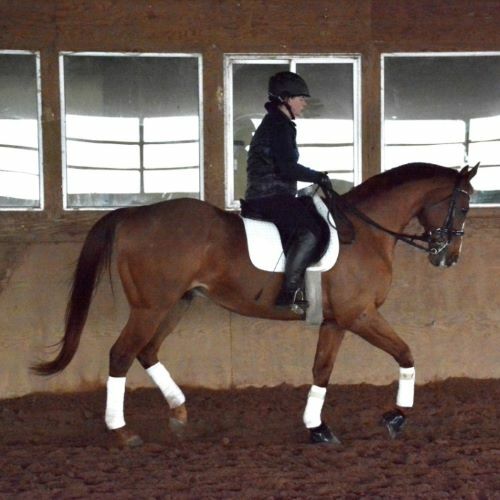 Extensive experience retraining OTTBs – from right off the track to upper level competitors. Students competing in Cadora Dressage, Trillium Jumpers and PT Eventing. Over 30 years coaching experience showing and training to FEI Dressage, Trillium and A Jumpers and OHTA.